A staple style of the late medieval era with Italian origins, the sallet provided great protection on the battlefield. 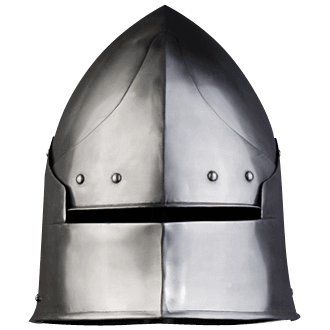 The Berthold Steel Sallet is a wearable, handmade steel armour piece based on this historical European war helmet. This distinctive helmet features a conical skullcap with a slight ridge along its center, ending in a point at the top. An extra piece of steel is riveted to the forehead area for extra protection, and the extended flange protects the back of the neck. When worn down, the moveable visor provides face protection while still allowing a thin line of sight. There is a cotton covered layer of foam within this medieval-inspired helmet, but we suggest wearing a padded arming cap underneath for proper safety and comfort. 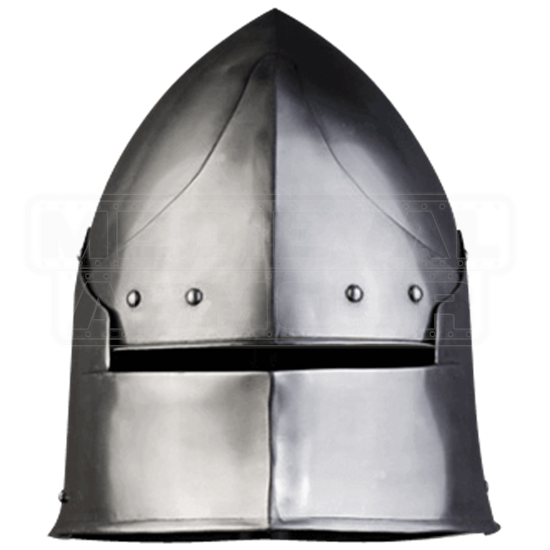 Fastened with an adjustable chin strap, the Berthold Steel Sallet makes a remarkable addition to historical armor costumes and LARP ensembles, lending a knightly air to any outfit.